NEW YORK — A California-based company that will launch a 3D printer to the International Space Station in 2014 is aiming to change the way space agencies think about how they transport goods to the orbiting outpost. But, using a machine to spit out spare parts for the space station is only the beginning. 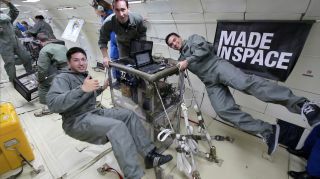 Built by the firm Made in Space, Inc., the first 3D printer in space will launch to the space stationaboard commercial spaceflight provider SpaceX's Dragon capsule. The mission will largely be a proof-of-concept flight, in which astronauts will use the device to demonstrate its functionality in the microgravity environment, Mike Chen, Made in Space co-founder and chief strategy officer, told an audience at World Maker Faire in Queens here Saturday (Sept. 21). While astronauts will initially use the 3D printer to create spare parts and tools for the space station. Made in Space is hoping "makers" on Earth will get a chance to flex their creativity by coming up with designs for science experiments, innovative projects and artwork. "Once our printer is there, we're going to be opening it up to the world to print things in space," Chen said, while openly soliciting ideas and encouraging people to contact the company with thoughts. If all goes well, a permanent version of the 3D printer will be launched to the International Space Station in 2015. "The paradigm shift that we want everyone to understand is: instead of launching things to space, just print it there," Chen said. "Why would you go through all the energy to build it here and launch it, when you can just build it there?" Made in Space co-founder and chief strategy officer Mike Chen discusses his company's 3D printer, which is launching to the International Space Station in 2014, with an audience at the 2013 World Maker Faire at the New York Hall of Science in New York City on Sept. 21, 2013. Made in Space was founded in 2010 with the mission of broadening access to space. "[I]t's really expensive and difficult to launch things into space, and that puts a real dampening effect on innovation," Chen said. Having a 3D printing capability on the International Space Station will open up possibilities for the materials that can be produced in orbit, and the types of experiments that can be performed in space. "Everything that you launch is going to have to withstand up to 9Gs in the rocket and crazy vibrations," Chen said. "Things in space are vastly over-engineered, really, for the first 8 minutes of its existence. Think about what you can do now that you have 3D printing capabilities on orbit. For the first time, we'll be able to design things for space that don't ever have to exist in a gravity environment." Follow Denise Chow on Twitter @denisechow. Follow LiveScience @livescience, Facebook & Google+. Original article on SPACE.com.